Are you still waiting for the verdict? On my visit to the Getty Museum in Los Angeles a few months ago, I was drawn to a pair of 1859 paintings by the British artist Abraham Solomon because of the biblical implications I saw in them. 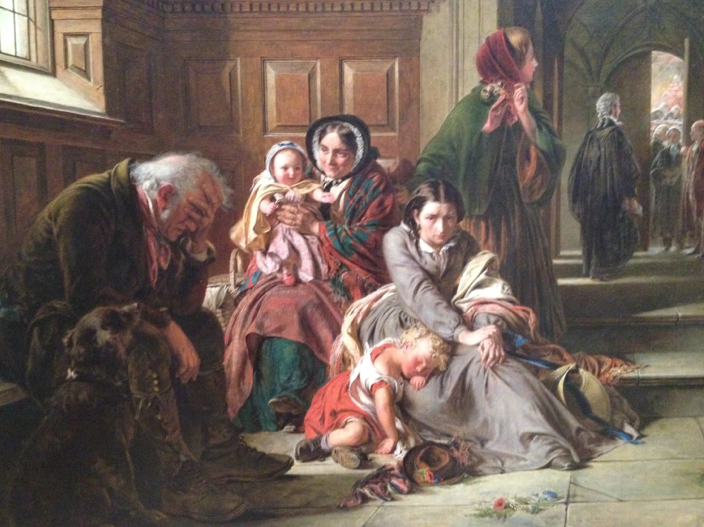 The first painting, Waiting for the Verdict, depicts a family waiting outside a courtroom while their loved one is being tried inside for a serious charge. By the expressions and body posture of the family, the wait is long, tiring, and reflects the seriousness of the charge, suggesting that a guilty verdict could be devastating to the family. 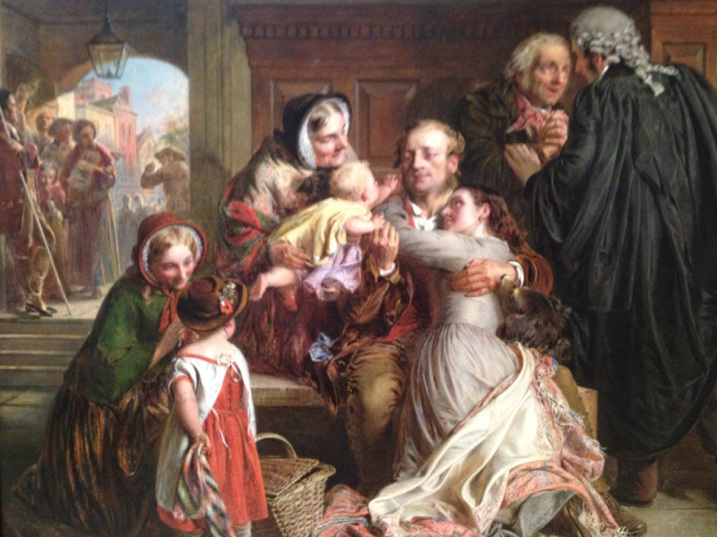 The other painting, Not Guilty, shows the relief of the family as they are united with their loved one who has been found innocent of the charges against him. The Bible states that every person who has ever lived has sinned (Ecclesiastes 7:20), that the punishment for sin is death (Romans 6:23), that all our attempts at being good and righteous are as filthy rags (Isaiah 64:6), and that every person will be judged for their sin. But the Bible also shows that many people, despite being guilty, will be pardoned and declared “Not Guilty,” and they will be blessed with eternal life in God’s Kingdom. In today’s culture in which the word “awesome” is used so freely and flippantly for almost everything, the implication of this passage is that God is truly awesome and amazing in his love, mercy, and kindness toward us! He is awesome in that while most other religions require their followers to earn their god’s favor and acceptability, it is only what God has done for us through Jesus Christ that matters. He is awesome in that even though we are all guilty of our sins, he declares us “not guilty” because of the sacrificial death and resurrection of Jesus Christ. He is awesome in that although all our good deeds could never measure up to his holiness, yet he makes it possible for us to have a right relationship with him simply through our faith in Jesus Christ (Romans 3:27-28). The wonderful and powerful message of the Bible is that we no longer have to wait for the verdict on that great Judgment Day. God stands ready to pardon us now—if we are ready to trust Jesus to take away our sins and follow him as Lord. So, dear reader, where are you today? Still waiting for the verdict? Or are you a “not guilty” believer who follows Jesus? He was a king who united and ruled his nation effectively for forty years under difficult conditions, including numerous rebellions and attempts on his life. He was a great poet, musician, composer, organizer, and military leader who inspired and motivated his fighting forces in repelling and conquering numerous invading foreign armies. And, as a man after God’s own heart, King David ruled his people justly. • David had at least eight wives (1 Sam. 18:27; 25:42; 1 Chron. 3) and ten concubines (2 Sam. 15:16; 16:22; 20:3) with whom he had twenty known sons (2 Sam. 3:2-5; 1 Chron. 3:1-4; 14:4-7) and unknown number of daughters—an ideal recipe for explosive family conflicts. • Solomon followed God and ruled wisely the united kingdom of Israel and Judah for most of his life. But because of the influences of his 700 wives and 300 concubines, he forsook God and increasingly worshiped their numerous false gods in later life. This allegiance to pagan gods by Solomon and succeeding kings led to the downfall of the kingdom. May we always earnestly confess our sins, seek God’s mercy and forgiveness, crave the restoration of the joy of God’s salvation, patiently accept God’s discipline, and live in the life-changing power, grace, and freedom of Jesus, our Lord. 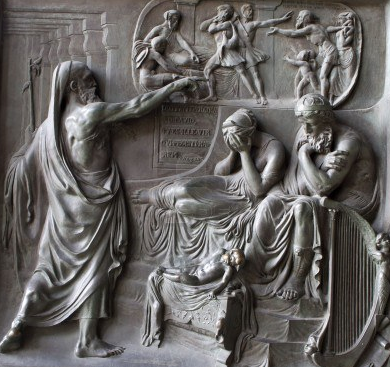 Pictured above: A panel on the great bronze front door of La Madeleine Church, Paris, in which the prophet Nathan confronts David and Bathsheba over their adultery and David’s murder of her husband Uriah. All Bible verses are from the New Living Translation, except those otherwise noted.